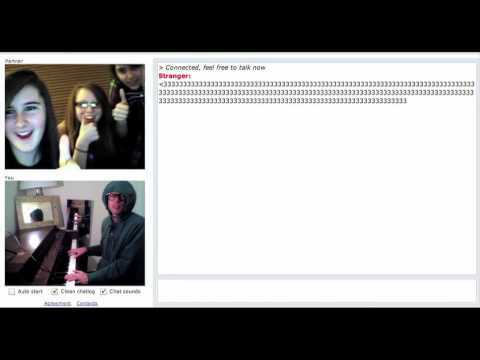 Chat Roulette, is a web site that connects random strangers over their web cameras. You just go on it and you get randomly connected to someone, thats it. Cool idea, but there is always someone who can come and along and make it awesome, like Merton did. No one really know who Merton really is, but we do know that he works with computers and taught him self how to play the piano. Being a shy performer he saw Chat Roulette as a medium to do his improvs and it’s amazing. His piano improv video’s have hit the 4 million mark on YouTube and are the highest ranking videos ever, take that GaGa. Can’t wait to see his other videos. Turn up the sound for this one, it’s hilarious! With thanks for this excellent website. I am trying to examine some a lot more posts but I cant get your website to display appropriately in my Opera Browser. With thanks again. Brilliant, cheers, I will bookmark you later. Good occupation below. I definitely enjoyed what you had to say. I really a great deal enjoy your weblog below, thank you so a lot you’ve got helped me out greatly Smile spread the adore. I ask all my good friends to pay a visit to this blog…. and I hope they will undoubtedly like.. Fantastic employment the following. I truly enjoyed what you had to say. I imagined your post was trendy and will check out generally.